The more organized and interactive the better. 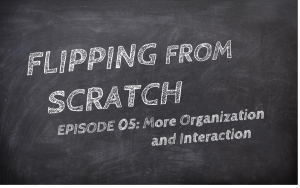 In episode 05 we actually use the content and interaction we have created thus far to build an example of an organization system from scratch. Particularly, we use Google Slides to create an “online book” that combines all of the resources thus far into an intuitive and functioning format. The idea behind using Google Slides is the universal accessibility from any internet capable device. Come build with me in this episode. The Worst Screencast Is Better Than The Best Lesson.